This peaceful retreat exudes calm and cool in its modern, spacious interior (288 sqm) and full length terrace overlooking a beautiful pool and extensive gardens (3200 sqm). Baan Santi comprises three double bedrooms, plus two single sofa beds in an air-conditioned living area. Two of the bedrooms offer private bureau space, making it ideal for those on a working holiday (wireless broadband internet is available throughout the property). The main vaulted living – dining space is huge and filled with natural light, with an extra-large kitchen for keen cooks. A permanent guardian lives (in separate quarters) on the property to provide 24 hour security. 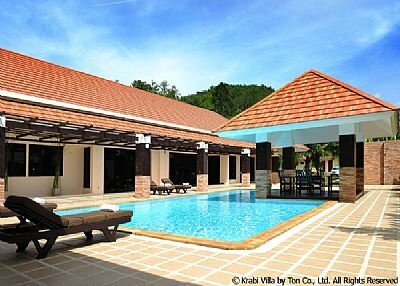 Baan Santi is fully serviced and managed by Krabi Riviera Co., Ltd., Krabi’s first and still foremost builder and operator of serviced pool villas, with more than ten years of experience. We offer instant booking and secure online payment by credit card, with “real person” follow-up to ensure we can prepare the best conditions for your stay. The villa is located in a quiet enclave, thereby ensuring our guests privacy and relaxation. Ao Nang beach is just 3km away. Baan Santi is designed for friends and family who wish to holiday together - privately and peacefully. The villa can comfortably accommodate up to 8 people. Those who do not have their own transport may use the unlimited taxi service (additional charge 1,000 THB per day) from 9am to 10pm to get to and from the beach, and a personal concierge is also available to arrange door-to-door sightseeing excursions.